— Carly Simon – Let The River Run. It seems like the whole genealogical world has converged on St. Charles, Missouri, for the 2015 National Genealogical Society conference. And given that keynote, it’s only right that The Legal Genealogist was looking for laws about rivers in old Missouri statutes last night and came across a number of provisions that could well have impacted any ancestors in the Show-Me State. 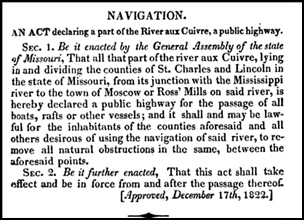 Tells us a thing or two about the value placed by early Missouri law on letting the river run, doesn’t it? Couldn’t get much more direct in terms of letting the river run, could they? Are we getting the idea here? Missouri is a state much blessed — and occasionally ravaged — by rivers and their waters: the Mississippi; the Missouri; the Osage; the Meramec; the White, and more. And its earliest laws reflect the importance of those rivers to our earliest ancestors — and how the view of the law was to let the river run. Texas is a little more liberal with water rights I believe. For instance, if I have a non-navigable stream on my property (say creek or fork off a river)then without permit, I may dam up the stream to create up to a 200-acre feet pool for my livestock. Now my neighbors might raise a little cain until the creek starts flowing again, but that’s the law. No mention of damages but you can bet your bottom dollar someone downstream will be taking you to court if that pool is not full pretty quick! Key word here is livestock…would ducks qualify? Hey, Judy! Don’t forget there’s a few Canadians also attending the NGS Conference. 😉 And what a great Conference it is and, so far, we’ve also been fortunate in having beautiful weather. Hope to see you in passing. I dunno Judy. Those laws sound pretty much the same as the ones in Ole Virginny where a lot of those early Missouri pioneers came from. And being allowed to dam up waterways at ease doesn’t exactly sound like “let the water flow” to me. Maybe I am missing something. But I loved your reference “River aux Cuivre” aka Cuivre River, and reference to Moscow aka Ross’s Mill–now moved upwater and called Moscow Mills. My old stomping grounds. Loving your reports vicariously. We locals call it “Quiver River” but of course in French, it means copper–which is pretty much its color–MUCK. Maybe you’ll get the chance to go see it in person. As I imagine you are already well-aware, Judy, river-related court cases are often rich with detail. Just the published summary of a single case in which my steamboat captain was a plaintiff included the names of several employees on the two boats that collided on the Mississippi as well as the name of a passenger who witnessed the collision and a lot more people not specifically named in the published summary, including 56 steamboat pilots that the court interviewed to determine what the common law was on rivers at the time.